EBJI » EBJI Students Win 11 Medals at San Jose Buddhist Invitational! You are Here:EBJI >> News >> EBJI Students Win 11 Medals at San Jose Buddhist Invitational! EBJI Students Win 11 Medals at San Jose Buddhist Invitational! Comments Off on EBJI Students Win 11 Medals at San Jose Buddhist Invitational! The San Jose Buddhist Invitational Tournament was held on February 20, 2011 at the San Jose State Event Center in San Jose, CA. With over 700 competitors from around the country, this tournament is acknowledged as one of the toughest regional tournaments in the Bay Area. Representing EBJI were 14 individuals ranging from students in the beginning children’s class to those in the advanced competitors class. Leading the way with Gold Medals for EBJI were Brandon Izzo, Jeff Fujimoto, Molly O’Rourke, Ann Shiraishi and Jason Wood. Brandon Izzo had a fantastic day winning all 4 of his matches by ippon. In his first 2 matches, Izzo switched his opponents with taniotoshi to score ippon. In his third match, he threw his opponent with haraigoshi for ippon about 2 minutes into the match. In his final match, Izzo faced an opponent he had previously lost to at the 2010 Junior National Championships. This meeting proved to be much different, as Izzo footswept this opponent for a wazari score and then choked him for ippon. 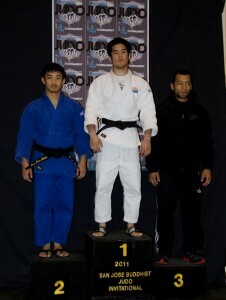 Jeff Fujimoto competed in the men’s 60 kilogram category. Having relocated to EBJI just a month ago, Jeff has made vast improvements in his overall movement and gripping. He footswept his first opponent for ippon about halfway through the match, then threw his second opponent with drop seoinage for another ippon. 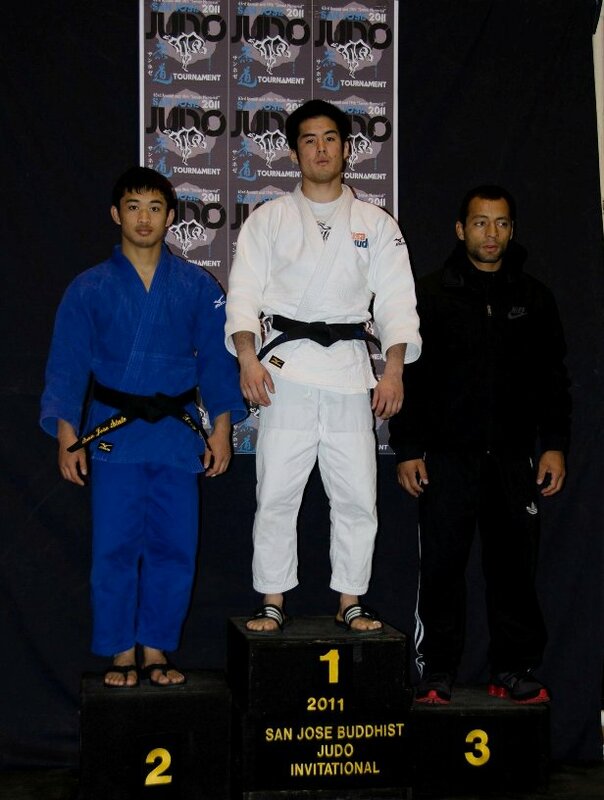 After receiving a walkover to the finals, he faced Matt Dong of San Jose State in the finals. Fujimoto easily controlled the match with this improved gripping and threw Dong in the second minute with drop seoinage for an ippon score and the gold medal. Molly O’Rourke cruised to a first place victory in the women’s 78+kg category. She easily disposed of both her opponents in less than 1 minute. This win moved O’Rourke to the number one ranking in the nation in her weight class. O’Rourke is in good position to make the 2011 Pan American Games Team competing in Mexico this summer. Ann Shiraishi easily defeated 3 of her opponents in her round robin competition. She threw her first opponent with uchimata for ippon and then arm barred her second opponent. In the finals, Shiraishi threw her opponent Alexa Liddie for ippon within the first minute with drop ippon seoinage, proving that her level of judo is at a different caliber. The 2010 World Team Member now turns her attention to the 2011 Pan American Championships, where she hopes to earn points to improve her ranking on the IJF World Ranking List. The top 14 women in each weight class will be chosen to compete at the 2012 London Olympic Games. Jason Wood surprised everyone by throwing all 4 of his opponents for ippon to win the Gold Medal. Wood, who is a member of the intermediate kid’s class, threw his first 3 opponents with osotogari for ippon and his last opponent with taiotoshi. This is only Wood’s third tournament.